It occupies a privileged position nestled on a wooded hillside, affording spectacular views through palm fronds, over the rolling green hills and across the protected forest. 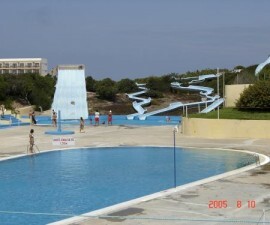 Open from June to September, the water park is a popular destination for holidaymakers as well as for nearby city dwellers looking for a weekend escape from their every day lives. The Parque Aquatico das Grutas de Mira de Aire, also known as Aquagruta, offers a tranquil yet fun-filled day of water adventure suitable for families and groups of all ages. Three water slides of varying heights offer plenty to challenge the more kamikaze guests, though even they might do well to avoid the enclosed water tube ride if they are scared of the dark! For the more sedate the large swimming pool awaits. Here guests can cool off from the summer heat whilst drinking in the serene beauty of their surroundings. Children have their own dedicated Aqualandia area in the park. 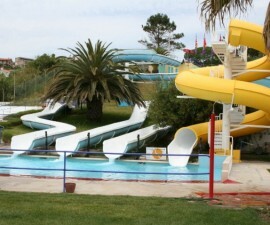 Here they can paddle in the shallow waters, enjoy endless descents on the two mini slides, take a shower under the mushroom waterfall or simply practice their swimming technique in the children´s swimming pool. 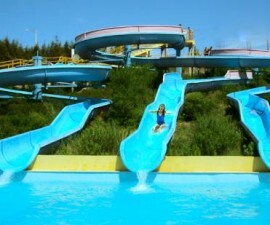 The park is as well known for its areas out of the water as for its slides. The sloping hillside is gently terraced and tastefully landscaped in order to make the most of the surrounding beauty. Large green areas surrounded by palms provide ample room for parents to relax and watch their children play. Sun-loungers are available to provide added comfort along with ample parasols to provide some welcome shade during the hottest times of day. Food and drink are available from the snack bar ensuring that once inside, visitors will want for nothing. The Parque Aquatico das Grutas de Mira de Aire is conveniently located just off the main A1 motorway from Lisbon and is easily reached by car. Ample parking is available at the park and some public transport links are also available. Take some time out to explore the national park and surrounding area and your trip will be complete.